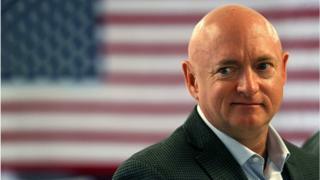 Former US astronaut Mark Kelly has launched a 2020 Democratic campaign for the late Senator John McCain’s Arizona seat in Congress. Mr Kelly, 54, is married to former Arizona congresswoman Gabrielle Giffords, who retired after being shot during a 2011 mass shooting. The couple became well-known gun control advocates following the attack. But in his Tuesday launch video, the Navy veteran focused his platform on healthcare, jobs and climate change. “It becomes pretty obvious pretty early when you get into space that we’re all kind of in this together,” Mr Kelly says in the video. Mr Kelly is a combat pilot who served during the first Gulf War and later flew four space missions for Nasa from 2001 to 2011. Though vocal in his politics, he has never held elected office before. Mr Kelly is running for the Democratic nomination ahead of next year’s special election to fill the last two years of Mr McCain’s Senate seat. Currently, that seat is held by Republican Martha McSally, who was appointed by the Republican Arizona Governor, Doug Ducey, after Mr McCain’s death. Ms McSally was selected after narrowly losing her Senate bid in November to Democrat Kyrsten Sinema – who became Arizona’s first Democratic senator since 1994. President Donald Trump won Arizona in the 2016 election, but US media say the state will be a key battleground in the 2020 elections. While a couple Democrats in the state have hinted at Senate ambitions, including Representative Ruben Gallego, US media report, Mr Kelly is the first to formally announce a campaign. In his campaign video, Mr Kelly said his mother, who became one of the first female police officers in her division in the 1970s, taught him about hard work, and his wife taught him “how you use policy to improve people’s lives”. “I always knew I was going to serve this country in some way,” he said. His wife, former Democratic Representative Ms Giffords, was shot in the head during a political event in Tucson in January 2011, leading to her resignation from Congress. Six others were killed during the shooting and 13 were injured. After the 2013 Sandy Hook Elementary School shooting, Mr Kelly and Ms Giffords founded the Giffords organisation, which seeks to unite law enforcement, veterans, and religious leaders “to reduce gun violence and make our communities safer”. The couple have been outspoken gun safety advocates since the attack, and appeared at the March for Our Lives rally organised by Parkland students last year in Washington DC. While Mr Kelly avoided discussing gun control in his launch video, his main issues are in line with what many of his Democratic peers ran on during the mid-term elections: Healthcare, wages, job growth, and the environment. He has also stated he will not be taking any corporate political action committee (PAC) money, much like other freshman Democrats and 2020 presidential hopefuls this past year.